The Ministry of Foreign Affairs of the Republic of Lithuania is implementing a Development Cooperation and Democracy Promotion Program in 2017, which corresponds to the areas of policies for development and cooperation for the years 2017–2019 of the Republic of Lithuania. One of the areas of the Program is the strengthening of administrative and institutional capacity in order to facilitate the implementation of reforms related to the Association Agreement signed between European Union and Ukraine. In relation to this, on the 24th of April 2017 the State Enterprise Centre of Registers of Lithuania and the Public Institution the Central Project Management Agency singed the project implementation agreement for project No. 2017-VB-UA-089 Establishment of the Address Register and Development of Enforcement Proceedings Information System in Ukraine (thereinafter – the Project). The Project is being implemented following the cooperation under project No. K2016-VB-UA-175 Assistance in Creating a Sustainable Registry System in Ukraine implemented in 2016. The aim of the Project is to provide assistance in the creation of a sustainable national Address Register and the development of the information system of the enforcement proceedings in Ukraine. According to the action plan of the Project quite a few activities are foreseen such as visits of the experts of the Centre of Registers to the institutions of Ukraine for the clarification of the local situation and needs analysis, participation in the bilateral meetings, and transfer of expertise of the Centre of Registers to the Ukrainian authorities. A significant part of the Project is dedicated to the organisation of training sessions of the Ukrainian specialists at the Centre of Registers where detailed presentations of the creation, management, development of the Address Register, the Bailiffs’ Information System and the Cash Restrictions Information System are being made. The comparison between the related legal framework of Lithuania and Ukraine is also performed and other important issues are discussed. It is expected that the transfer of Lithuania's experience to Ukraine will help to ensure greater dissemination and accessibility of information for various groups of the population and will form the basis for the creation of a sustainable state registry system in Ukraine. The project will become an example in Ukraine of how registers and information systems should be managed and will be the basis for further development of registers and their integration. The project “Further developments in the area of interconnection of registers of wills“ was led by the Estonian Ministry of Justice and co-funded by the European Commission (JUST/2014/JACC/AG/E-JU/6966) during the period from 1 October 2015 until 30 September 2016. The possibilities for making cross-border succession proceedings more efficient by electronic means were analysed during the project. Electronic registration of wills of the citizens of the European Union and data exchange related to wills between the Member States were the main topics focused on, as it is very important to ensure that the last wishes of the testator are respected and fulfilled regardless of state borders. Several legal and technical obstacles, which block access to information for the persons with a legitimate interest from another Member State were identified during the studies carried out within the project. The possibilities for eliminating obstacles were discussed in the European Union Council´s expert group together with the Member States and the representatives of the legal practitioners. As an outcome, recommendations for improving political and technical cooperation and access to information were prepared. According to the recommendations, an interactive tool, ensuring a direct access to the right contact point providing necessary information along the way could be created in the e-Justice Portal. In addition, dynamic forms of the European Certificate of Succession and its application were created for the portal which simplify the process of completing the form and in the future also the process of transmitting the form. While dynamic forms are going to be made available in the portal already in the near future, the implementation of technical developments to enable more efficient and safer access to the information relating to wills shall be carried out in the course of follow-up projects during the years to come. The project was carried out in cooperation with the European Network of Registers of Wills Association, the Council of the Notariats of the European Union, the Estonian Chamber of Notaries, Estonian Centre of Registers and Information Systems, and the Member States of the European Union. While Lithuania, Hungary, Spain, Bulgaria, Greece and Austria contributed directly to the project, the representatives of 20 Member States took part in the work of the European Union Council´s e-Justice expert group. Since the first year of its establishment (1997) the State Enterprise Centre of Registers (Centre of Registers) has maintained close co-operation relations with similar institutions and agencies in Sweden, the Netherlands, the USA and other countries in developing and improving real property administration and information systems and has been taking an active part in bilateral and multilateral international projects. 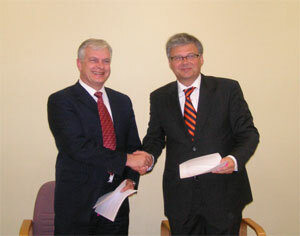 In 2006, the Centre of Registers has signed Agreements for the Provision of Information from the Real Property Register and Cadastre through the EULIS Programme with Kadaster (the Netherlands), HM Land Registry (England and Wales), Lantmäteriet(Sweden) and Norsk Eiendomsinformasjon as (Norway). In 2007, such agreements were signed with Property Registration Authority (Ireland) and Land Registry of Iceland. Customers in these countries, including the Lithuanian customers, who use on-line services provided by the national land registers will be able to access real property cadastre and register information in other countries. In 2008, the Centre of Registers expects to sign Agreements for the Provision of Information from the Real Property Register and Cadastre through the EULIS Programme with similar agencies in Austria and Scotland. In 2002-2007, a consortium of seven European real property cadastre and register agencies, companies and organisations from England and Wales, Austria, Lithuania, the Netherlands, Norway, Finland and Scotland, implemented the project European Land Information Service (EULIS) , supported by the European Union. After the successful implementation of this project, a decision was made to continue activities under the EULIS Programme. 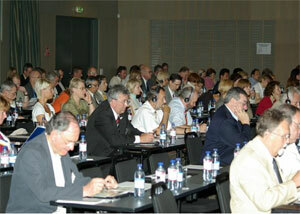 The official launch of the live EULIS service took place on 22 November 2006 at the European Mortgage Federation’s Annual Conference in Brussels; however practically it was implemented in 2007. In 2006-2007, the Centre of Registers took part in the project European Land Information Service Plus (EULIS Plus), which was funded by the EU e-TEN Programme. The goal of the project was to investigate and evaluate the possibilities of Czech Republic, Slovak Republic, Poland and Latvia to connect to the live EULIS service. The project investigated national legal frameworks, current technical solutions of the land registers, public access to information and security issues. It was also important to validate the prospects of the real property market and the customers’ needs. Under the Co-operation Agreement signed with Swedesurvey AB in January 2006, the Centre of Registers together with Swedish experts provide consultations in multilateral projects executed by Swedesurvey AB. 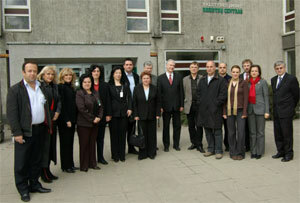 In 2007, the Centre of Registers and Swedish experts arranged seminars and workshops for the heads and specialists in land administration, management, cadastre and register agencies from Macedonia and Russia. Moreover, delegations from Turkey, Finland, Tajikistan, Azerbaijan and Romania visited the Centre of Registers where they had a possibility to get familiar with the Lithuanian real property administration, cadastre and register system, and the organisation and management principles.With regard to real property valuation the Centre of Registers collaborated with Swedesurvey ABfrom Sweden and the National Land Survey of Finland which provided the specialists of the Centre of Registers with the opportunity to get practical experience in the real property mass valuation and land value mapping. Close contacts in the field of valuation for taxation are maintained between the Centre of Registers and the Lincoln Institute of Land Policy. Training programmes, consultations and literature made a significant input to the know how of the specialists working at the Centre of Registers who successfully developed and implemented a system of real property mass valuation for taxation.The Centre of Registers takes an active part in the activities of the Working Party on Land Administration of the United Nations Economic Commission for Europe (UN ECE WPLA), its workshops and conferences. The Working Party on Land Administration is a forum for the land registration and cadastre organisations of the ECE countries. Participation in the activities of the Working Party on Land Administration enables to get familiar with the modern tendencies in the field of land administration and provides for an opportunity to exchange information and experience between different countries. The Centre of Registers also joined the activities of the International Association of Assessing Officers and became the member of this Association. While improving the mass valuation system of land and building, the Centre of Registers started cooperation with the Institute of Revenue Rating and Valuation (IRRV) and the International Property Tax Institute (IPTI). On 19-21 June 2007, the Institute of Revenue Rating and Valuation (IRRV) and the International Property Tax Institute (IPTI) in cooperation with the Centre of Registers organised an international conference Role of Property Tax – Effective Revenue Mobilisation. Over 140 participants from 20 countries were introduced to the pertinent and timely issues such as real property taxation, setting taxable value, tax collection and efficient use, tax rates and assessing tax burden, etc. In October 2007, the Institute of Revenue Rating and Valuation presented the Centre of Registers with an award for Excellence in Valuation. Specialists of the Centre of Registers also take part in the activities of international organisations, such as the International Association of Surveyors (FIG), the European Land Registry Association (ELRA), EuroGeographics, the European Group of Valuers’ Associations (TEGoVA) and others. Considering the experience of the European Union countries and maintaining international relations, the Centre of Registers seeks to develop the real property administration system in Lithuania, which is open not only for the national but also for foreign customers.